PanARMENIAN.Net - Triada Studio's Shadowmatic 3D puzzle continues its triumphal journey in the game world, increasing its array of awards and fans all over the world. 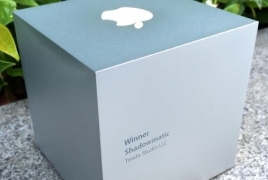 Today, Shadowmatic earned the highest accolade from tech giant Apple, winning the Apple Design Awards prize. Apple Design Awards (ADA) is a special event hosted by Apple Inc. at its annual Worldwide Developers Conference. The event is meant to recognize the best and most innovative Macintosh and iOS software and hardware produced by independent developers, as well as the best and most creative uses of Apple's products. The ADAs, as they are commonly known, are awarded in a variety of categories which vary from year to year. Since 2003 the physical awards were designed with an Apple logo that glows when touched. Launched on January 15, 2015, Shadowmatic found itself in the center of attention: the game was included in the AppStore’s Editor's Choice section, with Apple naming it the best game of January. On April 4, 2015, Shadowmatic was honored at ArmNet Awards, scoring prizes in Innovations and Design and Comfort nominations, as well as Grand Prix for the best mobile app. In May, the 3D puzzle scored the Excellence in Visual Art and Media Choice awards at DevGAMM international conference in Moscow. The game was also featured in the Game of the Day section at the iOS Games website for iPhone, iPad and iPod Touch games. Shadowmatic is compatible with iOS devices: iPhone 3GS and higher, iPad 2 and higher, iPod Touch 4 and higher. In future, the game will be made available for other desktop platforms as well. The game is developed by Triada Studio Games, a new division of Triada Studio, a computer animation studio with a history of over 20 years.